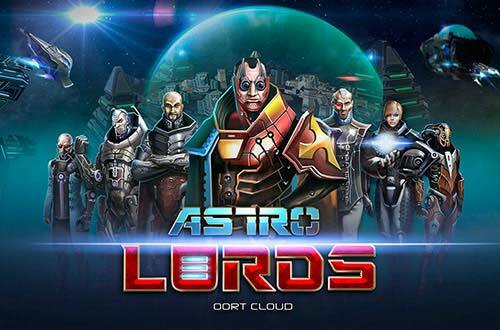 Astro Lords is a free 3D MMO, Space RTS strategy game that combines the excitement of real time combat with construction management and strategy elements such as exploration, raiding and espionage. Welcome to the Oort Cloud, a vast field of asteroids on the fringes of the solar system. As the leader of your asteroid, you must develop your stronghold by constructing facilities such as mines, power plants, factories and laboratories. Resources must be gathered, or stolen, in order to construct ammunition, cyborgs and spare parts for space ships to fuel your expansion. As your empire grows, you will be able to capture more asteroids by colonizing empty ones, or capturing developed asteroids from your enemies. Astro Lords is the first MMO RTS to feature moving bases on a spherical map, putting you in the driver’s seat. Will you maneuver your asteroid in pursuit of your enemies, flee from hostile foes, or explore the vast nebulae and discover alien ruins? Leading the charge against your enemies are the Captains. You can recruit up to 6 Captains from 7 different classes. Will you recruit a Warrior and focus your efforts on combat? A Scientist, to boost your research output? A Spy, to keep tabs on other Astro Lords and alien bases? With over 50 different skills to develop, you can tailor your Captains to suit your gameplay style. Each Captain can be fully controlled in battle against other players and AI alien enemies, and will fight to defend your base while you're offline too. Captains and starbases can be improved through skills, runes, artefacts and officers, giving you complete control over your combat style and abilities. The click-and-drag Artillery style combat in Astro Lords: Oort Cloud provides fast-paced real-time combat – (think Worms, but without having to wait your turn! ) Players can choose between a number of different battle modes including Team Deathmatches, Duels, Boss Fights and Alien Challenges. You will experience complete freedom of action and social interaction. Become a worthy Astro Lord!